Living Intentions, a leader in raw and sprouted food products, announces the re-launch of its product lines in totally fresh bold packaging. The colorful new packaging design for Gone Nuts! raw and sprouted nut blends, Superfood Cereals, Salad Boosters, and more, will launch in Anaheim, CA at Expo West 2012. With Living Intentions’ outrageously tasty products, the choice to include raw, sprouted, and nutrient rich superfoods in your diet is a simple one. Each product is purposefully crafted to include the finest quality of ingredients, and gently air-dried using low temperatures to protect and preserve the raw and sprouted nutrient integrity. 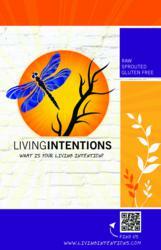 Living Intentions focuses on raw, sprouted, and gluten free products. Food in a raw, natural state contains essential enzymes, vitamins, and minerals. Sprouted foods ease digestion and increase vitality. With Living Intentions, you don’t have to compromise the flavor to eat healthy, raw foods. The Living Intentions line includes sprouted superfood cereals, sprouted seasoned seeds and trail mixes, sprouted flours and a delicious line of sprouted and seasoned nut blends. Living Intentions’ products can be found from coast to coast at stores such as Whole Foods, Sprouts, Raleys, Wegmans and many other natural food markets. Living Intentions was founded on one simple premise: To nourish the world with the most nutritious and delicious, flavor-rich food. All of our innovative and nourishing products are developed with purpose and care. We source the best quality of ingredients without compromise to create unique and dazzling flavor combinations. No weird stuff added. Our low temperature, gentle air-drying process allows for enhanced nutrient integrity. Our products are Raw, sprouted, gluten free and outrageously delicious. Our diverse line of products includes Gone Nuts! raw and sprouted nut blends, superfood cereals, salad boosters, sprouted seeds and trailmixes, and more. For more information on Living Intentions, call 415-824-5483 or visit our facebook page at http://www.facebook.com/LivingIntentions. Our intention: Satiate the pallet at the highest vibration.